The 2019 Statewide “Don’t Drop It On Alabama” Spring Cleanup will be held on April 20-27, 2019. The cleanup is held annually and coordinated by Alabama PALS (People Against a Littered State), which also coordinates and implements the Alabama Coastal Cleanup, the Alabama Clean Campus Program, the Alabama Adopt A Mile and Adopt A Stream programs statewide. Each of these efforts are made possible through partnerships with business and industry, state associations, and state agencies that are committed to making Alabama a leader in environmental awareness. PALS is proud to continue and expand its partnership with Coca-Cola Bottling Company UNITED and The Coca-Cola Company as the Title Sponsors for the 2019 cleanup effort. This partnership is enabling PALS to incorporate the recycling of plastic bottles into the annual cleanup during 2019. In 2019, 25 cities and counties will be incorporating plastic bottle recycling into their cleanup efforts. The 2019 “Don’t Drop It On Alabama” Spring Cleanup is also made possible through PALS Sustaining Partners, ALDOT, ALFA, Alabama Farmers Cooperative, Vulcan Materials Company, Honda Manufacturing of Alabama, the Association of County Commissions of Alabama, and The Poarch Band of Creek Indians. PALS distributed approximately 190,000 bags statewide for the 2019 cleanup, as well as all materials and supplies to all participating cities, counties and volunteer groups. 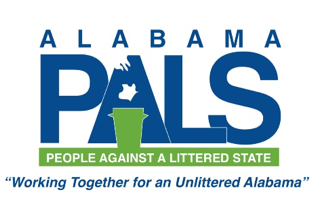 A list of all cleanup coordinators for the 2019 effort can be found at alpals.org. Volunteers interested in participating are encouraged to contact the local coordinator to join an existing cleanup, or to establish their own local cleanup within their respective community. PALS hopes to surpass the 600 tons of litter that was reported during the 2018 Spring Cleanup, where 65 counties participated.